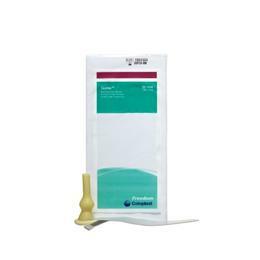 The Gizmo male external catheter is a latex catheter with single-side adhesive strip, and a pure, soft, natural, latex-reinforced funnel end. No adhesive touches the skin. The device is twist-proof. The sizes range from Small to Large and come either packaged individually, or as a box of 100.